My Naught Thoughts : Stalker Alert!!!! When did our romance heroes become stalkers? When did it become okay to creep unknown into a girl's bedroom to watch her sleep, or to control her every movement? When did being controlling, possessive and down right creepy become synonymous with romance? Am I missing something here? Or is it that if you give your hero hot looks, a fat bank account and power it then becomes okay to stalk someone? Are writers of today saying that a female lead would accept being treated like she was in the middle ages for a pretty face and a shinny gold nugget? At first I didn't really notice it as I read the Twilight series. 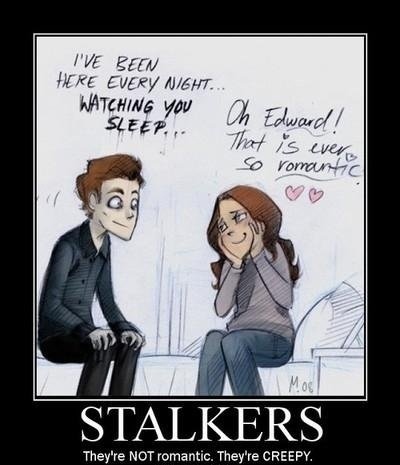 Yes I found it disturbing when Edward snuck into Bella's bedroom. (Truth be told I was still hung up on glittering vampires - really!!! and Bella's obsessive need for Edward) Or maybe his controlling ways were just a little less overt. Yes I'd read books with the he-man, macho man male leads before, but then my genre had always been historical romance so I expected it, the times and all. I think I was finally blown away when I read Fifty Shades. As I kept reading I remember thinking, if Christian was an average looking, check-out clerk at Walmart, would he still be so enticing to Anastasia. Strip away his good looks, money and power and what do you have left? A controlling, possessive, jealous, insecure, mental case. Not my cup of tea in a hero. And that's my naughty thoughts on stalking behavior.